This is a military Science fiction tale set in a well-built world. It centers around a brigadier who, after losing many of his soldiers in a disastrous battle, signs up for a suicide mission to a planet named Godeena. Every other group sent to this planet has disappeared. Henry, however, has become obsessed with the planet. He sees this challenge as a way of making up for his mistakes in that battle. So he enlists a group of criminals from the top security prison planet Hades, giving them a chance to gain their freedom if they should survive the mission, but at the same time thinking that if they die at least they won't be missed. The strength of this book is in the world-building. Reading it felt like reading something set in a very real world. 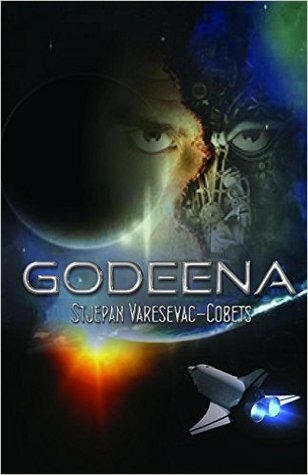 The different planets, the political life and interactions with other races that the humans are at war with, and especially the planet Godeena and the dangers that await the main characters there. It was all very well thought out. I also appreciated the honest portrayal of military life with its downfalls. This story doesn't attempt to glorify fighting or portray the enemies as monsters and the main characters as pure heroes. Instead it gives an honest view of the characters and those they interact with. We see "heroes" that abuse their fame and power, we see corruption and inaction, we see the huge price that ordinary soldiers often pay for the mistakes of their commanders, and some light is also shed on the unfair treatment of the female soldiers by some of their commanders. The portrayal of some of the female characters is sometimes less than stellar, with the focus sometimes being on their looks and their interactions with the main character being a little weird, but I saw that as being due to the main character's point of view. We see the world, and these characters, through his eyes, so it makes sense that he would sometimes look at the people around him in a less than fair way or take it for granted and assume that these female characters are in love with him or something. In the same way there was a little too much swearing for my tastes, but I again saw it as part of the characterization as it only appeared in the dialogue and seemed to fit the particular characters who were swearing. Back to the point. The story was well-written and engaging. I began to feel that the story dragged a bit when they were training and a lot of time was spent on the weapons and how they worked, but to be fair in the end when they actually had to use these weapons it did help me visualize what was happening a bit better and helped make the terminology more accessible when they were deciding to use certain weapons. Also, right around that time my favorite character Diana was introduced. Her parts of the story were the most interesting and she provided an excellent point of view from which we could explore the horrors of the planet. Because so many other reviewers mentioned the language I feel the need to comment on it. Yes, it's clear that the author's first language is not English and yes, there are a few awkward bits of dialogue here and there where that becomes clear, but did it honestly take away from the enjoyment of the tale? To me the answer is a clear no. In fact, I much prefer the awkward dialogue when I compare it to some of the over-edited and meaningless/boring prose of some other books I've read. When you're reading a story about characters who go to different planets and interact with otherworldly forces I'm not sure why the expectation is that the characters all sound like they dropped out of an American movie. Overall, I enjoyed this tale quite a bit. It was an interesting mix of science fiction and fantasy and military fiction with some great world-building. I would recommend it to sci-fi readers who are not too young: as I mentioned before there's quite a bit of swearing and there are some mature topics as well. A solid 4 stars. I would be interested in seeing the author write more stories set in the same world, perhaps even with some of the same characters. Sign into Goodreads to see if any of your friends have read Godeena.